Olive oil is delicious, but the by-production of 1000 liters of olive oil is 1500 -2000 liters of wastewater. The disposal of olive mill wastewater causes environmental problems, which Alper Karakaya (Duzen, TR) and his partners from the RHODOLIVE project want to tackle by developing a fermentation approach for cleaning the wastewater and produce added-value products. 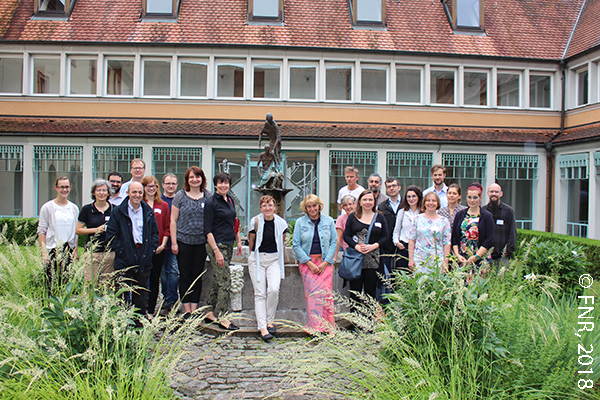 On 11th and 12th of June 2018 at the congress centre in Schmerlenbach, Germany, 22 representatives of projects funded within the cofunded call of ERA CoBioTech participated in the first workshop organized by the Agency for Renewable Resources (FNR), within the framework of the European Biotech Hub. The European Biotech Hub was established by ERA CoBioTech with the aim of empowering biotechnology stakeholders with tailor-made support regarding information, communication, networking and research funding. Biotechnology is one of the so-called Key Enabling Technologies (KET) that provides the basis for innovation in a range of products across all industrial sectors,with the aim to help tackling societal challenges. Biotechnological research is essential for the transition of a global economy currently based on fossil feedstock to a sustainable environmentally friendly bioeconomy, but the understanding and acceptance by the public regarding research in biotechnology, systems biology and synthetic biology is still limited. In order to improve this image problem and to bring biotech research closer to the public, the researchers from the 22 projects, granted with ca. 31M € within the first call of ERA CoBioTech, cofunded by the EU, were trained on how to better communicate their research activities and results and to inform and involve the public in the process of developing new or improving existing biobased compounds or products. Those products and services developed within the projects will improve the health and wellbeing of millions of people around the world. In the role-play “elevator pitch”, Agapi Theodoridou (DE), TRALAMINOL project (right), explains to the fictitious “Member of European Parliament” Alan Goddard (UK), MEMBRANE project (left), in 90 seconds how important her research project is for European citizens. 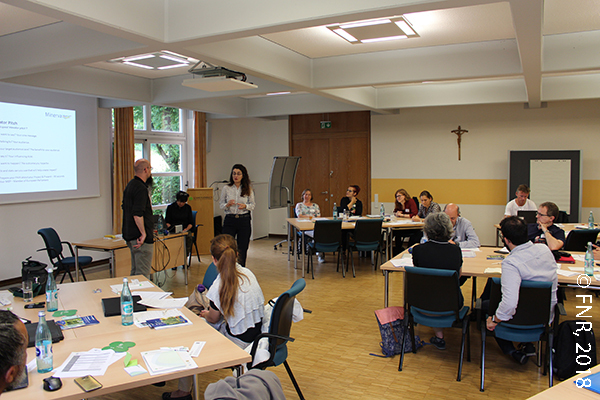 In the contemplative atmosphere of the former convent in Schmerlenbach, and under the guidance of the workshop moderator Rhonda Smith (Minerva, UK), the participants learned the importance of having a clear and effective communication plan for addressing their specific target group for their project. This focus on communication will help with reaching out to the broader public, thus facilitating market introduction and acceptance of the biobased products developed by the projects. 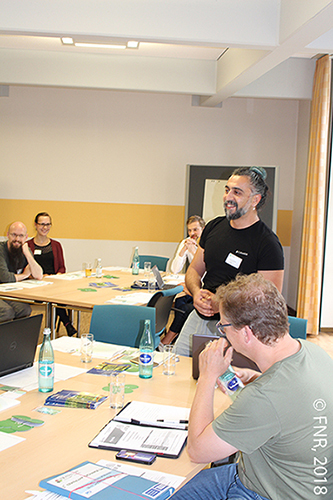 The participants also have been able to practice presenting their project in simple and understandable ways, in order to help researchers from other disciplines, funders, policy makers, and non-academics understand the aims of their projects. This might also help to convince stakeholders in the future of the benefits of bio-based products and mitigate their concerns with biotech research. The communication managers, coordinators and members of the ERA CoBioTech executive team have discussed these joint communication activities, and have agreed to help each other to reach a broader audience and achieve a greater impact, than if their work was done alone.